/ Home / Press office / To brood or not to brood: Are marine organisms evolving to protect their offspring in response to ocean acidification? Marine organisms living in acidified waters exhibit a tendency to nurture their offspring to a greater extent than those in more regular conditions. Researchers at Plymouth University have found that polychaete worms located around volcanic vents in the Mediterranean grow and develop their eggs within the protection of the family unit – in contrast to closely-related species that release them into the water column to fend for themselves. The scientists say the findings could provide an important insight into how organisms might adjust to increasing levels of carbon dioxide in the sea – and the ramifications that might have for future biodiversity. Their report – published in Scientific Reports – was based on field research off the island of Ischia in Italy and lab-work in which the breeding patterns of the worms were observed at closer quarters. The team found that 12 of the 13 species that had colonized the vent area exhibited brooding characteristics, most notably producing fewer and larger eggs that were usually retained within some form of protective sac. Ten of those species were in higher abundance around the vents than in the ambient areas surrounding them – some by a ratio as high as nine-to-one. 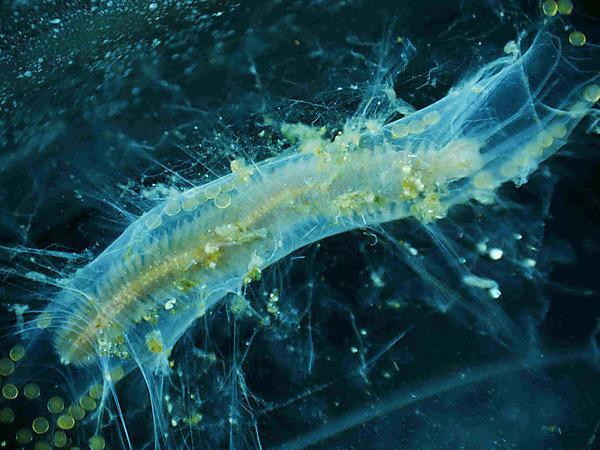 When genetic analysis was conducted, it became clear that worms from inside the CO2 vents were from a sibling species of Platynereis massiliensis, one that has diverged from Platynereis dumerilii in the recent past – confirming that all of the polychaete species are brooders of some sort.